In the arena of high altitude balloons, Canon’s PowerShot series of digicams are the camera du jour for sending high into the stratosphere. There’s a particular reason for this: these cameras can run the very capable CHDK firmware that turns a $100 digicam into a camera with a built-in intervalometer along with a whole bunch of really cool features. It appears this CHDK firmware is much more powerful than we imagined, because [Chris] is now transmitting pictures taken from a Canon a530 to the ground, using only the CHDK firmware and a cheap radio module. These PowerShot cameras have an ARM processor inside that runs VxWorks, a minimal but very capable OS for embedded devices and Mars rovers. By tying in to the Tx and Rx lines of the camera, [Chris] can issue commands to the OS, change settings, and even install his own code. 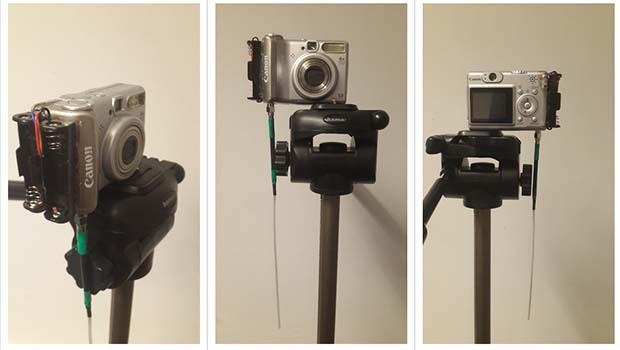 With the help of [Phil Heron]’s SSDV encoder written in C, [Chris] was able to get the camera to transmit images with a small radio transmitter that fits in the battery compartment. Right now, [Chris] has only built the CHDK + SSDV for the Canon a530, but with how useful this build is, we expect to see an improved version very shortly.